I always give away my baked goods lest I eat them all to myself, self-control is not my forte. For more than half the year, many of the goodies I’ve featured on my blog have also been shared with my boyfriend (save for one week when I forgot to pack some granola and he sarcastically bemoaned, “This is not acceptable behavior”). I’ve long understood the love that comes from cooking or baking for someone you care about, there’s nothing that makes me as elated as when my friends bring me dessert or when my mom buys me an egg tart from the Chinese bakery, so fresh it steams the plastic baggy it came in. My boyfriend now has his own Tupperware that I put his baked treats in. When I hand over his edible gifts, he roars with excitement as if he just won the lottery, tears open the box and takes a big bite before reluctantly saving the rest for later. I think one of the top reasons I bake every week is getting to watch the way he eats followed by the giddy look on his face. These crackers are no exception and generate the same welcome to everyone I shared it with. 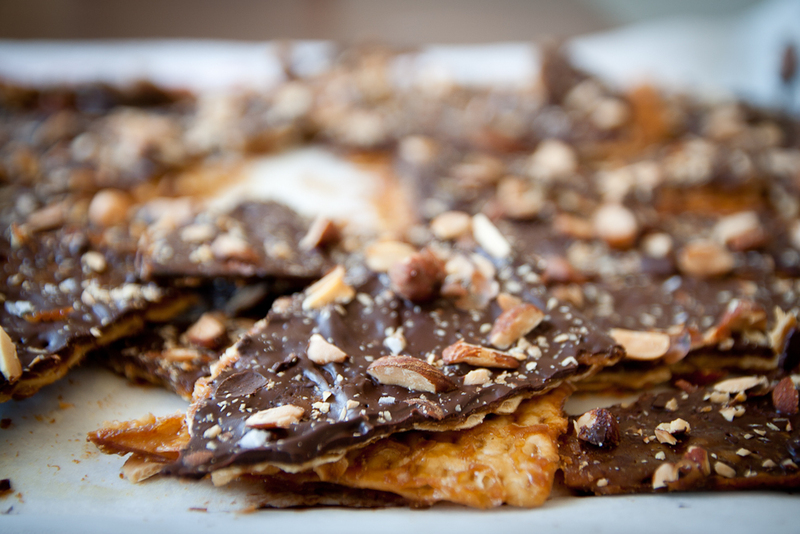 I’ve never eaten matzo crackers before and normally wouldn’t since they’re too bland, but covered in an irresistible combination of chocolate, toffee and nuts, you can’t go wrong. 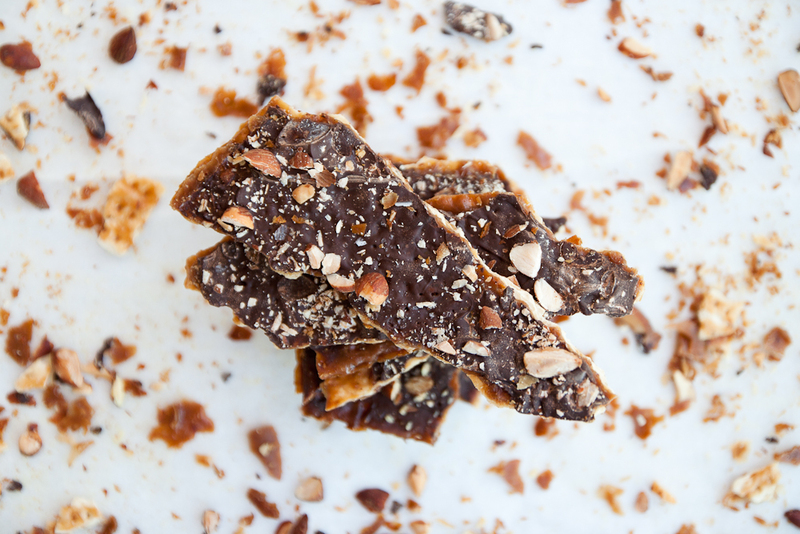 Not only is this recipe easy peasy, the result is dangerously addictive. It makes me think of peanut butter brittle minus the stone hard crunch. I love recipes that allow you to customize it to suit your preferences or whatever you have on hand. Instead of almonds, you can sprinkle some chopped pistachios, or toasted coconut if that’s what you’re into, maybe even cocoa nibs if you’re fancy like that. I like adding flaky sea salt when I can’t decide if I’m craving for sweet or salty. No matter what you add, these crackers are transformed from bland paper-like crisps to crack-like treats. I’m warning you, these are dangerous. 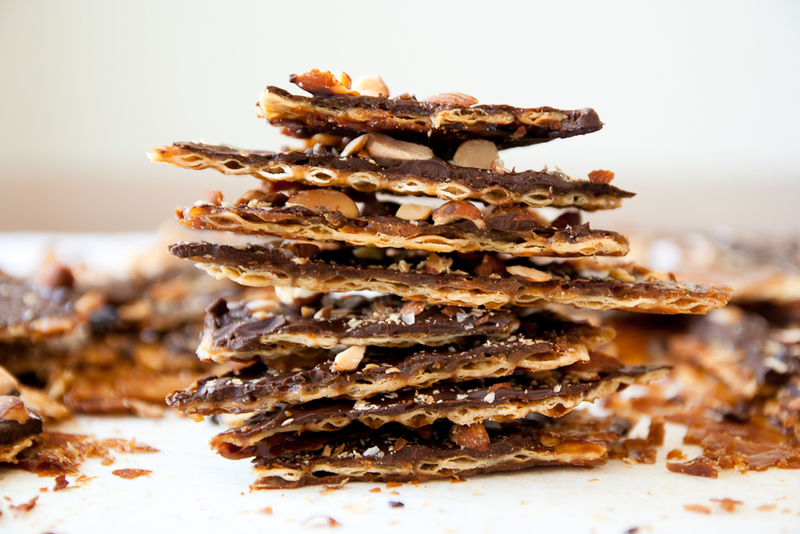 If you can't find matzo crackers, you can use plain saltine crackers instead. Cover a rimmed baking sheet (approximately 11 by 17 inches) completely with foil, making sure the foil goes up and over the edges. Cover the foil with parchment paper. Preheat the oven to 375°F. 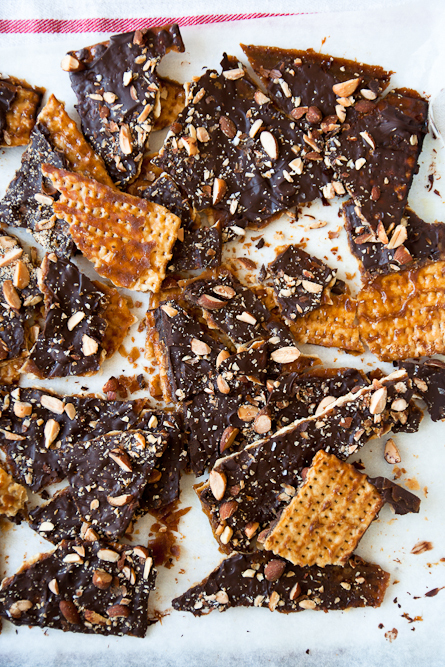 Line the baking sheet with matzo crackers, breaking extra pieces as necessary to fill in any spaces. 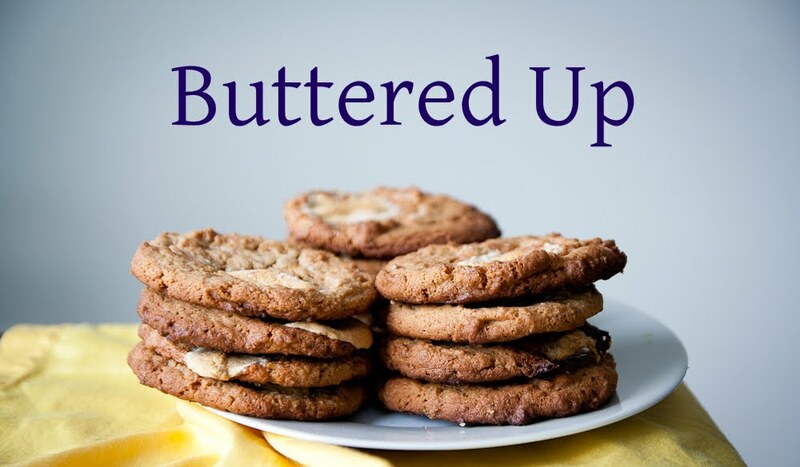 In a medium-sized heavy duty saucepan, melt the butter and brown sugar together, and cook over medium heat, stirring, until the butter is melted and the mixture is beginning to boil. Boil for 3 minutes, stirring constantly. Remove from heat, add the salt and vanilla, and pour over crackers, spreading with a heatproof spatula. Put the pan in the oven and reduce the heat to 350°F degrees. Bake for 15 minutes. As it bakes, it will bubble up but once in a while, make sure it’s not burning. If it is in spots, remove from oven and reduce the heat to 325°F, then replace the pan. Remove from oven and immediately cover with chocolate. Let stand 5 minutes, then spread with an offset spatula. If you wish, sprinkle with chopped almonds (or another favourite nut, toasted and coarsely-chopped), a sprinkle of flaky sea salt, or roasted cocoa nibs. Let cool completely, then break into pieces and store in an airtight container until ready to eat. It keeps well for about a week.